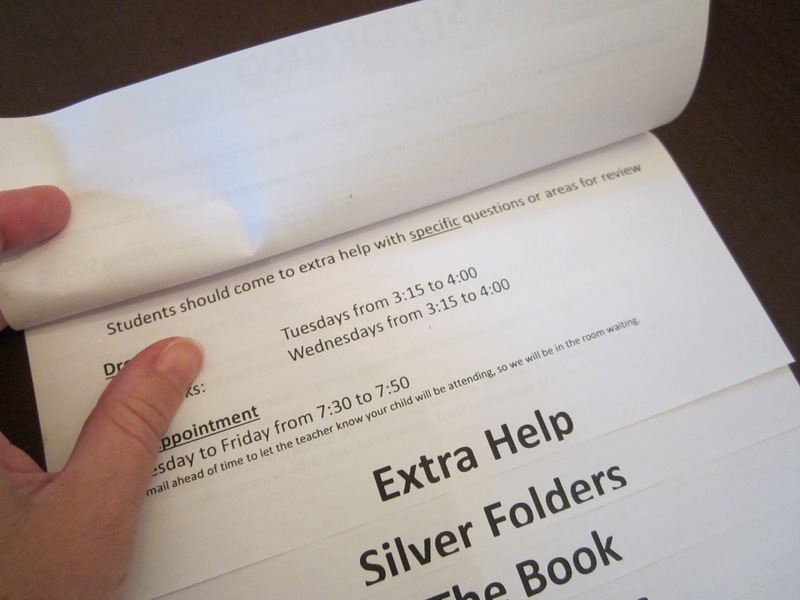 Parents receive and/or complete a ton of paperwork from their child’s school the first week or two of school. Most of the materials are distributed in some sort of class orientation with the teacher. 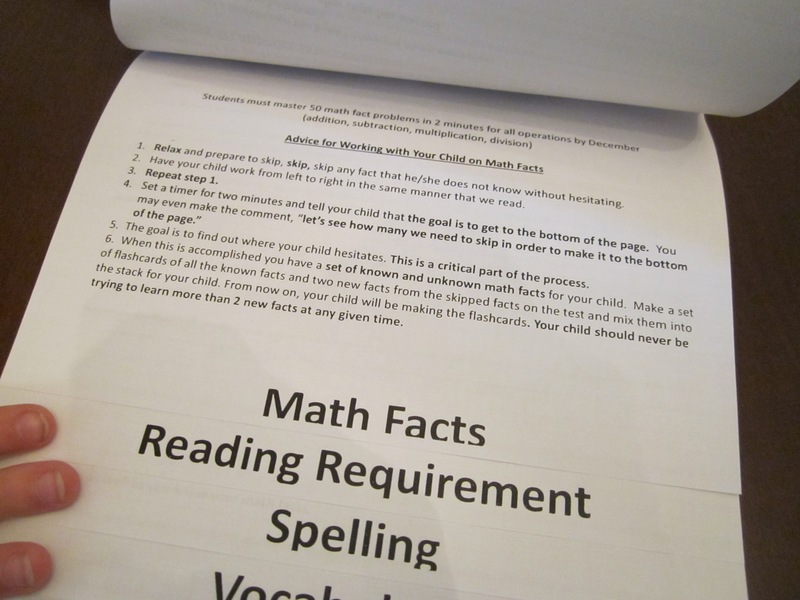 A lot of information about math fact tests, spelling test days, and reading requirements is thrown at you in a short amount of time. As a parent, I jam the papers in a folder near the school directory and do not really look at it again. As a teacher, I am silently fuming when parents ask me repeatedly about my extra help days or my monthly reading due date. Isn’t anyone referring to the FAQ sheet I gave at the beginning of the year, which CLEARLY outlined my policies and procedures? No, they are not because it is sitting in that dusty folder next to the school directory. This year, I am taking care of the problem. I created a flip chart with all of the information I want parents to have for the school year. I attached magnets to the back, so parents can stick this handbook to the refrigerator. 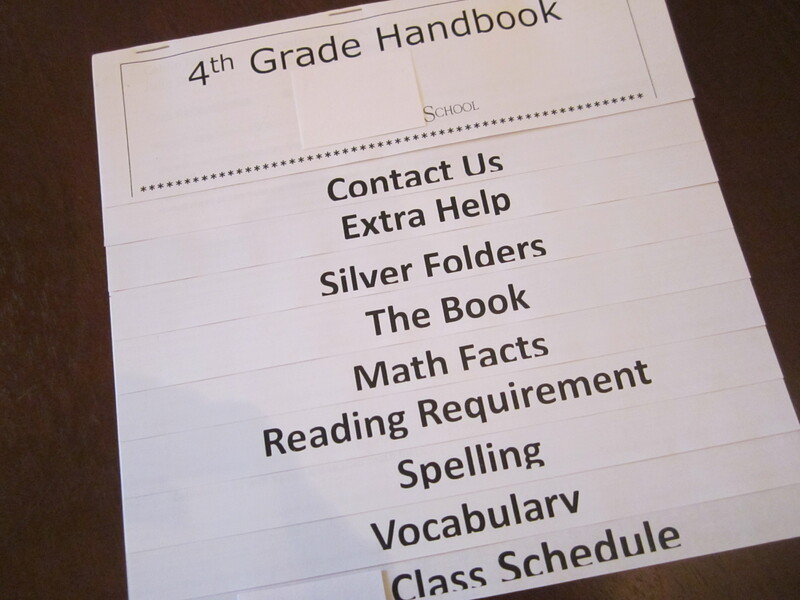 For parents who will not be receiving TheRoomMom’s amazing 4th grade handbook, create your own “Class Cliffs Notes” that you can post in a central location at your house. Below is my suggested list of helpful class information to have on hand. What other school information do you need throughout the year but forget after the first week of school? Teacher Contact Information– Note the best way to contact the teacher and the amount of time it will take for the teacher to reply. Have the e-mail address and cell phone number (or school phone number) in a place that is easy for you to find. In most cases, it is easiest to contact a teacher by e-mail rather than by phone since we can’t answer the phone during the school day. If you would like to speak with the teacher, send an e-mail listing several times that you are available to have a phone conversation (or conference) to avoid playing phone tag. Let the teacher call you. Extra Help Times– Be aware of any weekly extra help the teacher offers. I have a weekly drop-in time every Tuesday after school for 45 minutes. Parents may also e-mail me or send a written note if a student needs one-on-one help. If your child’s teacher provides some form of extra help, know how/when it works. Late Work Policies– If students are sick, make note of how to get make up work and how long a student has to complete make up work. If a student does not do homework or other assignments, ask about any deductions to the final grade or other consequences for incomplete work. 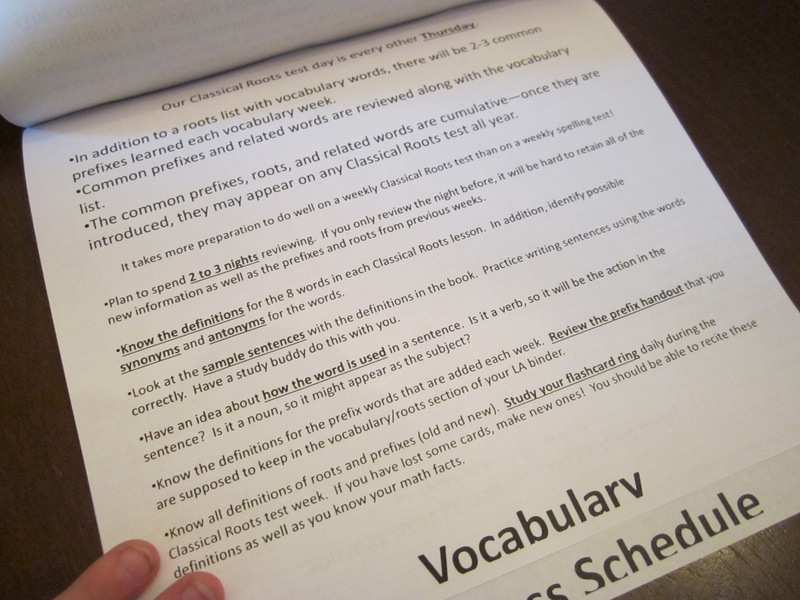 Reading Requirement– Most classrooms have a nightly reading requirement that may not show up in the assignment book. Find out if your child is expected to complete work independently each evening that is above and beyond assigned daily work. Study Tips and General Test Schedule– Many teachers have a weekly test schedule for areas like math fact tests and weekly spelling lessons. For example, my teammate gives math fact tests every Wednesday and Friday. I alternate spelling and vocabulary tests every Thursday. If there is a reliable test schedule, add it to your family calendar. If the teacher gives any study advice, write it down, so your child can study efficiently for these weekly tests. My teammate and I shared math facts study tips and vocabulary study tips in our handbook. 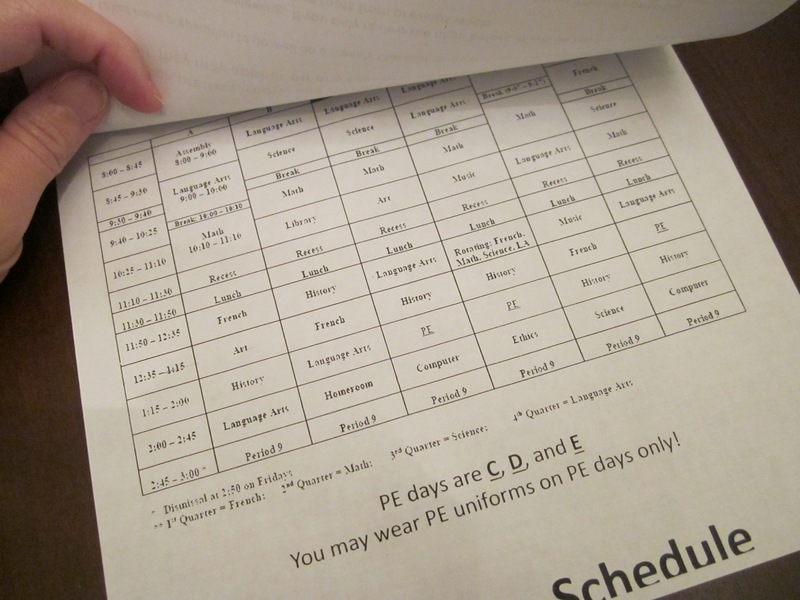 Daily Schedule– Know which days students have PE, art, or other classes that may require special clothing. My children need to know PE days, so they will wear sneakers. I like to know which day is art day, so my kids won’t wear the white uniform shirt. If students can have visitors at lunch, note lunch times. If you can actually have the entire weekly schedule for your child posted on the refrigerator, that is helpful for the whole family. I found the flip book idea on Pinterest (of course). First Grade Fairy Tales has the step-by-step directions and template for making the flip book. My new plan is to use the template to make a babysitter/dogsitter flip chart to compile all of the notes that I need to give to our sitters. I want to include emergency contact information, pediatrician names and numbers, basic dog care, and other information I always need to write down for the babysitter. If I finish, I will post some photos.